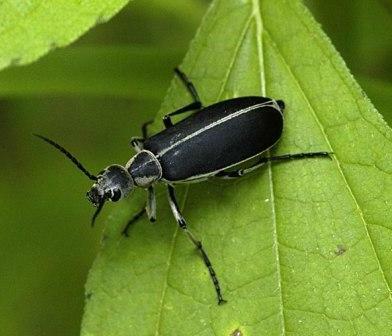 Region: This beetle is commonly found in central and northern United States, and eastern Canada. There is an all- black species called Epicauta pennsylvanica is common in the East. Life cycle: One generation is produced each year. The beetles overwinter in the soil as larvae. Physical Description: This elongated soft-bodied insect is black with a narrow gray outline around each elytra, with long legs and a narrow neck, and is about 1/2 inch long. The cylindrical eggs are laid in clusters in the soil. The larva will vary with each instar. The first instar is yellow with long legs and very active. The second instar is very similar with the exception of having short legs. The third through fifth instar are thicker and look more like white grubs in shape. The sixth instar doesn't have any legs and is much darker in color. The seventh instar is white, small, and very active. Feeding characteristics: The adults will swarm and feed on foliage and fruits, while the larvae feed on grasshopper eggs. Controls: handpicking is recommended, but use gloves, the insect secrete a harmful substance that may cause blisters. You can protect your plants with mosquito netting. For serious infestations, dust with sabadilla.